The well-known saxophonist Branford Marsalis is born in 1960 as a member of the incredible Marsalis family, among which trumpeter Wynton Marsalis (1961) may be the most famous member. Their father Ellis Marsalis is a pianist and a music professor who affected many musicians such as Harry Connick and Nicholas Payton. Other musician sons are Delfeayo(trombonist) and Jason (drummer). Similar to Wynton, Branford is not only a perfect jazz musician but also a soloist in classical music performances because of his early education and experiences. After his graduation from Berkeley he played alto and baritone with Wynton in Art Blakey's Jazz Messenger then helped his brother to form Wynton's Quintet. For some tours, he also played with Herbie Hancock, Miles Davis and Dizzy Gillespie. He contributed in first solo album of Sting in 1985 (continued playing regulary with Sting until 1999 however we can still see his name in new projects of Sting). Moreover he had an interesting experience as the leader in the band in Jay Leno Show and as a side man in Grateful Dead. When we come to 1995, we see Branford Marsalis Quartet including Jeff "Tain" Watts (drums), Eric Revis (bass) and Kenny Kirkland (piano). Joey Calderazzo became a member of Branford Marsalis Quartet after the pianist Kenny Kirkland died in 1998. Before that, Joey Calderazzo(1965) was listening to jazz but he was playing in his rock band until he met Michael Brecker in 1987. He played with several musicians in several albums and met Branford around 1990. 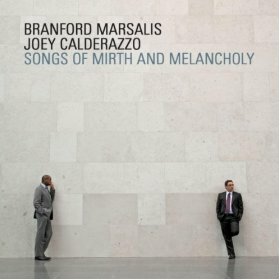 Afterwards, Branford Marsalis and Joey Calderazzo worked together in many albums but their first duo album is released in 2011 with the name "Songs of Mirth and Melancholy". Why? Branford answers this question as "George Wein made some free time available for Marsalis Music at Newport one summer. Joey and I did a duet set when it was over I looked at Joey and said we gotta record". I've clearly felt the changing style of Joey Calderazzo from virtuosic to melodic throughout the album considering his early records such as Haiku. Joey, in a way, explain the reason for that by saying in the booklet "I get sick of playing on a regular basis. It is important to have certain things under your fingers so they are there. But musically, personally, people grow up sooner or later: life experience, trial and error, getting over problems of one kind or another. All music is a reflection of one's life." Branford says in another interview that there were so few people who can actually create melody and Joey Calderazzo did it. From this perspective I can say that Branford Marsalis is harmonic with the melodic structure created by Joey Calderazzo. You can understand what I mean when you listen to the partitions of saxophone. The name of the album also gives some clue about that the melodic structures you will listen to. I should add that you will see one Wayne Shorter's song and one Brahms' composition in the album. 1. One Way: I think this song is the mirth part of the album, whose beginning and end is full of dynamic saxophone tones of Branford Marsalis. In between, I listened to a great virtuoso of piano. You will keep the rhythm with Branford and Joey's inner swinging rhythms while listening to this song. 2. The Bard Lachrymose: This great composition starts with a great ballad from Marsalis. Its melancholy continues with Joey's incredibly emotional piano. 3. La Valse Kendall: The melancholy continues with the saxophone accompanied by piano then the main theme is played by the piano again. 4. Face on the Barroom Floor: The main concentration of this Wayne Shorter's composition is on saxophone and we hear a very similar tone to Wayne Shorter from Branford, which is a little bit softer. 5. Endymion: Connected to the end of the 4th track, this song is more melodic and starts with saxophone which is fading gradually and giving floor to the piano. After that, Branford Marsalis is carrying out one of the most important performances of the album. 6. Die Trauernde: There is nothing much to say. You should listen this masterpiece composition from these musicians. 7. Hope: This song can be the best and most melodic composition which is performed very well by the incredibly controlled breathe of Branford Marsalis. Congrats for the composition to Joey and for the spirit to Branford. I strongly recommend that you listen to this track of the album carefully. Especially, the extraordinary and awesome outro of the song makes this song a standalone masterpiece. I felt that hope is something fragile after that song. 8. Precious: After the great 7th track, I feel a little bit strange thinking that the melody is kind of continuing with some nuances but when the melody continues I've noticed that this is a piano dominant piece and have cooler saxophone tones. It is strange that although the composers change, the songs do not cross the borders of the concept of the album. It is hard to do that but it seems that they did it. 9. Bri's Dance: The outro of the album is surprisingly is a fast moving song but again without crossing the conceptual borders of the album. It makes me perplexed to see Branford Marsalis perfect timing during entrance to and disappearance from the song. The last page of the booklet contains a wonderful saying from Branford about musicians and musical education, which I won't write here and leave to you to buy the album and read it. To say a little bit about the record quality; I can say that in a duo record there are lots of space where you can hear a wide dynamic range and details of each instrument, however at the same time it is also very crucial not to add distortion since it is very noticeable in these types of records. This is very well achieved in this record and you can hear no compression or any kind of additional digital work in it. The saxophone is very well focused in the stage and the piano is successfully beyond it and widen the image. The highs of saxophones were recorded very carefully and the fast transitions between highs and lows and the breathes of Branford is incredibly realistic. One last advice; it is important to listen such concept albums from beginning to end in one trial.